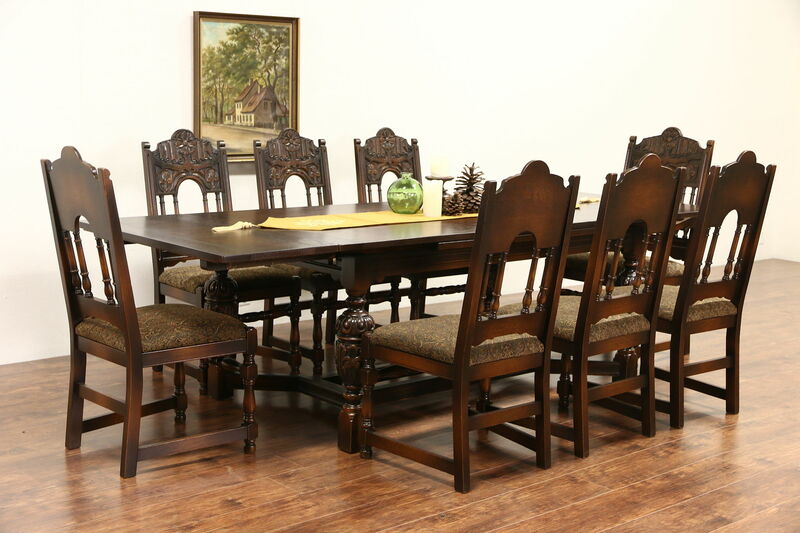 Richly carved of solid oak in the English Tudor manner, this dining set includes a table with two pull out leaves and eight chairs with new upholstery. This American made antique furniture was made by "Life Time" of Michigan, the signature remains on the side pieces. The restored deep finish is in excellent condition, frames are reglued to serve another generation. When all 8 chairs are used, they must either straddle the corner legs or be used two at each end, see photos. Table size is 40" wide, 30" tall, legroom is 25" and 6' long when closed, with both 18" wide leaves pulled out, length is 9' overall. The arm chair measures 23" wide, 26" deep, 44" tall, the seat is 18" high and 18" deep, seven side chairs are 20" wide, 22" deep, 42" tall and seats are 17" deep.